— NASA's Mars Science Laboratory with its car-size Curiosity rover is now on its way to the Red Planet, after its launch from Cape Canaveral, Fla. on Saturday. Outfitted with the most advanced scientific gear ever sent to Mars in an effort to learn whether conditions there can support microbial life, the rover is also equipped with an autograph collection, starting with the signature of the President of the United States. 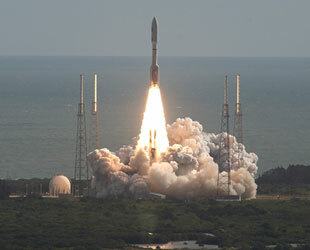 Starting with a liftoff at 10:02 a.m. EST (1502 GMT) atop a United Launch Alliance (ULA) Atlas V rocket, the Mars Science Laboratory (MSL) spacecraft set off on an 8 1/2 month trip to Mars. The Curiosity rover is expected to land on the planet on Aug. 6, 2012 following a parachute- and retrorocket-assisted descent that will culminate in a sky crane carefully lowering it the final 66 feet (20 meters) to the surface. Hidden in plain sight on the rover's deck, or its top, is a plaque inscribed with the signatures of President Barack Obama and Vice President Joe Biden, in addition to other administration and NASA leaders. The etched metal plate, which continues a more than 40-year tradition of sending presidential plaques on planetary missions, is only one of the signature collections on board Curiosity. Elsewhere on the rover is the autograph of the 14-year-old girl from Kansas who gave Curiosity its name along with millions of digital signatures from members of the public who signed up through NASA. 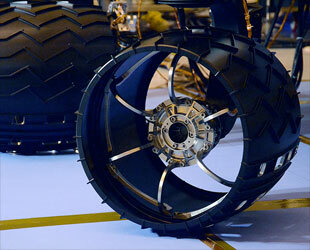 Curiosity itself will also add its own signature to the martian surface, courtesy of its specially-treaded wheels. Curiosity's presidential plaque evokes those signed in the late 1960s and early 1970s by Richard Nixon and attached to each of the Apollo spacecraft that landed on the moon. Also represented on the plate are the president's science advisor John Holdren and NASA administrator and deputy administrator Charles Bolden and Lori Garver. Ed Weiler, who was the space agency's associate administrator for science at the time when the plaque was created some 10 months ago, also signed. NASA's Mars program leaders round out the autographs on the plate, including Doug McCuistion, program director; Michael Meyer, lead scientist; and Dave Lavery, program executive for the Mars Science Laboratory. Curiosity's deck as imaged by its mast camera. An arrow points to the approximate location of the presidential signed plaque. MSL's project manager Peter Thesinger, who was quick to point out he did not sign the plaque, revealed its existence in an interview with collectSPACE. "It's on the rover in the front left corner," Thesinger said, adding that it will be visible and that at some point will be photographed on Mars by Curiosity's camera-topped mast. Lavery told collectSPACE that arranging for the president to sign required some well-timed planning. "It turns out getting the president's signature on anything is rather involved," he said. "When we made the request to the White House for permission to launch, we took this along with us and said, 'Oh by the way, if you sign this we will stick it on the rover.'" President Obama's signature and the others on the plaque were transferred onto the metal plate from a letter they had signed, but one special young lady had the chance to autograph Curiosity's body, adding her name to the rover she named. Clara Ma was 12 years old when she was selected as the winner of NASA's essay contest to name its new Mars rover. She chose "Curiosity," writing in part that "curiosity is the passion that drives us through our everyday lives." 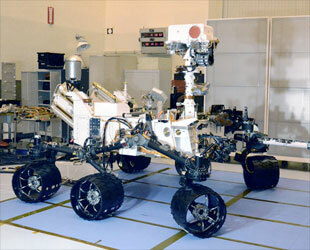 As part of her prize, she was invited to the Jet Propulsion Laboratory in California, where in June 2009 she donned a "bunny suit" to step into a clean room and sign her name on the rover. The panel she signed was later installed on Curiosity's base. "I signed my name and then I wrote 'Curiosity,'" Ma told collectSPACE, recounting the signing three years later. Now in ninth grade, Ma said she hopes she might catch a glimpse of her autograph once its on Mars but even if not, sending her signature the 352 millions miles (567 million kilometers) is exciting enough. "Knowing that my name will be on another planet is pretty amazing," she said. Ma may have been the only person to physically sign the rover's body, but she is not the only one anticipating their name landing to Mars. 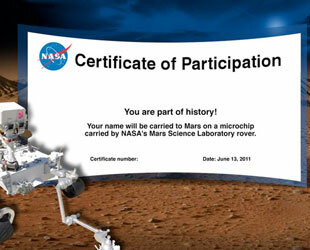 Example of NASA's digital certificate confirming a name has been included on the microchips flying to Mars on Curiosity. Silicon chips attached to Curiosity's deck bear the digital signatures of people who submitted their names through NASA's website for going to Mars aboard the rover. Each chip is about the size of a dime. More than 1.24 million names were submitted online. They were etched into silicon using an electron-beam machine used for fabricating micro-devices at JPL. In addition, more than 20,000 visitors to locations of work on the rover at JPL and Kennedy Space Center wrote their names on pages, which were scanned and reproduced at microscopic scale on another chip. 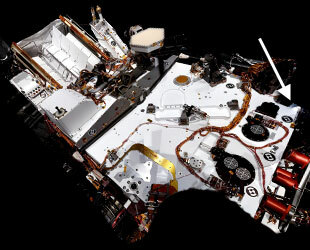 Of course, the presidential plaque and "Send Your Name to Mars" microchips were minor additions to Curiosity, which is equipped with 10 science instruments with a total mass 15 times as large as their counterparts on the earlier Mars rovers Spirit and Opportunity. Some of Curiosity's tools will be the first of their kind on Mars, such as a laser-firing instrument for checking rocks' elemental composition, and an X-ray diffraction instrument for identification of minerals in powdered samples. Curiosity will leave its mark on Mars with the samples it collects and analyzes, providing scientists back on Earth with a better understanding if the planet has ever offered conditions favorable for microbial life. It will also advance the knowledge needed for crewed missions to follow in the future. To haul and wield its science payload, Curiosity is twice as long and five times as massive as Spirit and Opportunity. Like the earlier rovers, which landed in 2004, Curiosity is outfitted with six wheels with a "rocker-bogie" suspension system enabling them to stay in contact with the ground at all times, even over rocky or uneven terrain. Each 20-inch (50.8-centimeter) aluminum wheel features a tread specially designed to allow Curiosity to leave behind the autograph of its maker, the Jet Propulsion Laboratory. As Curiosity drives over the martian terrain, the groves in each wheel will form a string of 'dash' and 'dot' imprints — morse code that will spell out "J-P-L."